Every spring it seems that I get frustrated with my crowded closets, and lack of things to wear. I sort through my clothes, and threaten to donate or throw them out; but they sit in a box in my hallway, until the day that I decide that I can't part with them if I can't replace them. I've had these ridiculous floral shoes for about four years. I've maybe worn them once or twice. I picked them up for a dollar at JCPenney, and immediately regretted the purchase. Because not every deal is a good deal. They sat in the donate box for a week, before inspiration struck and I decided to give them a face lift. I pulled out a couple of bottles of fabric paint, and mixed together a bright watermelon color. They are a bit bold, and I'm just now trying to wrap my mind around wearing neons for a second time. I used to layer my electric green, and hot pink socks, only to cuff them and expose the first layer (anyone else?). Anyway, back to the shoes. After a couple of layers of paint they were still asking for a little something more. I decided to join the glitter shoes band wagon, and add a glitter toe cap. I first painted on a thin layer of mod podge, and then glittered like crazy. Doing it this way created a nice solid glitter base. After the first layer had dried, I mixed some mod podge with the glitter, and added two top coats to seal in all the glitter goodness. As you can see I ditched the little shoe ties. They were unnecessary and distracting. I now have a bit of a funky toe, but I can deal with it. 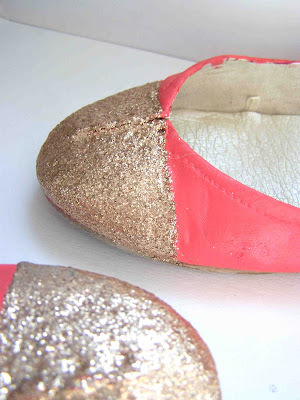 The glitter and neon are a bit bold for my wardrobe, but I am liking the neutral+neon trend. 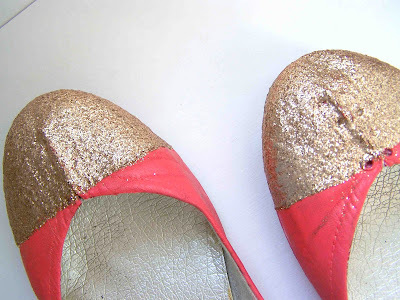 The golden glitter might not be neutral, but leans that way. There you have it, my first shoe refashion...more of that to come. I'm a new follower on your blog. 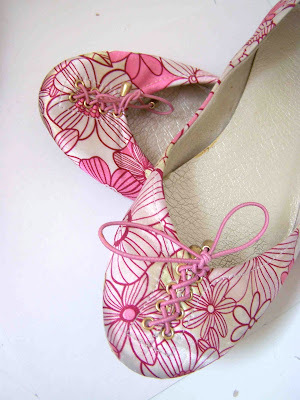 Great post about the shoes make over ,its given me some food for thought and wondering dare I try. As for the sewing I trying to make up my mind about buying a sewing machine, a nice easy one for a beginner,to start sewing again...again that's a laugh last time I used a sewing machine was at school and that was a few light years ago!